Holy Saturday is a neglected day in parish life. Few people attend the Services. Popular piety usually reduces Holy Week to one day - Holy Friday. This day is quickly replaced by another--Easter Sunday. Christ is dead and then suddenly alive. Great sorrow is suddenly replaced by great joy. In such a scheme Holy Saturday is lost. We sing that Christ is ". . . trampling down death by death" in the troparion of Easter. This phrase gives great meaning to Holy Saturday. Christ's repose in the tomb is an "active" repose. He comes in search of His fallen friend, Adam, who represents all men. Not finding him on earth, He descends to the realm' of death, known as Hades in the Old Testament. There He finds him and brings him life once again. This is the victory: the dead are given life. The tomb is no longer a forsaken, lifeless place. By His death Christ tramples down death. The Vespers of Holy Saturday inaugurates the Paschal celebration, for the liturgical cycle of the day always begins in the evening. 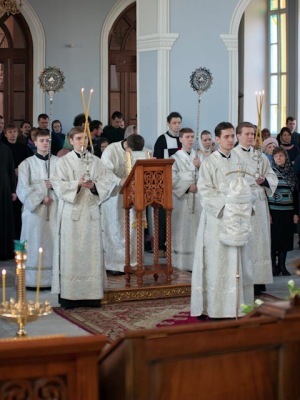 In the past, this service constituted the first part of the great Paschal vigil during which the catechumens were baptized in the "baptisterion" and led in procession back into the church for participation in their first Divine Liturgy, the Paschal Eucharist. Later, with the number of catechumens increasing, the first baptismal part of the Paschal celebration was disconnected from the liturgy of the Paschal Light and, formed our pre-paschal service: Vespers and the Divine Liturgy of St. Basil the Great which follows it: It still keeps all the marks of the early celebration of Pascha as baptismal feast and that of Baptism as Paschal sacrament (death and resurrection with Jesus Christ - Romans 6). On "Lord I call" the Sunday Resurrectional stichira of tone I are sung, followed by the special stichiras of Holy Saturday, which stress the death of Christ as descent into Hades, the region of death, for its destruction. But the pivotal point of the service occurs after the Entrance, when fifteen lessons from the Old Testament are read, all cen¬tered on the promise of the Resurrection, all glorify¬ing the ultimate Victory of God, prophesied in the victorious Song of Moses after the crossing of the Red Sea ("Let us sing to the Lord for gloriously has He been glorified"), the salvation of Jonah, and that of the three youths in the furnace. Then the epistle is read, the same epistle that is still read at Baptism (Romans 6:3-11), in which Christ's death and resurrection. become the source of the death in us of the "old man," the resurrection of the new; whose life is in the Risen Lord. During the special verses sung after the epistle, "Arise O God and judge the earth," the dark Lenten vest¬ments are put aside and the clergy vest in the bright white ones, so that when the celebrant appears with the Gospel the light of Resurrection is truly made "visible to us, the "Rejoice" !with which the Risen Christ greeted the women at the grave is experi¬enced as being directed to us. The Liturgy of St. Basil continues in this white 'and joyful light, revealing the Tomb of Christ as the Life-giving Tomb, introducing us into the ultimate re~lit7 of Christ's Resurrection, communicating His life to us, the children of fallen Adam. One can and must say that of all services of the Church that are inspiring, meaningful, revealing, this one: the Vespers and Liturgy of St. Basil the Great on the (Great and Holy Saturday is truly the liturgical climax of the Church. If one opens one's heart arid mind to it and accepts its meaning and its 'light, the very truth of Orthodoxy is given by it, the taste and the joy of that new, life which shown forth from the grave.